Many of our schools in affected regions of south-western BC were built prior to the knowledge that brick, stone or concrete block (URM) structures would not perform well in the event of an earthquake. 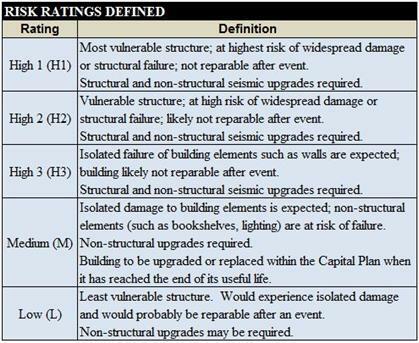 Many of these institutions have been assessed by engineers from APEGBC to be at high risk of partial or complete structural failure. As of late 2015, over 7,300 kids in elementary K-7 grades sit within the most volatile high-1 risk level public schools, not including enrolment numbers for StrongStart. Over 50,000 grade K-12 children occupy 125 provincial schools designated high 1, 2 or 3 risk levels - all capable of partial or complete collapse in the event of a significant earthquake.. that scientists state is statistically overdue. With LifeGuard Structures school desks, we don't have to rely on luck with our childrens lives, whilst years are sometimes taken to fund and plan the seismic upgrading these URM buildings need to make them safe. Our student desk has been lab tested capable of supporting weights of 150t, they are designed to shield the occupants as much as possible from flying or falling debris, and are also bullet / blast resistant. Classrooms full of them can prevent pancake collapse and open escape corridors for rescue. 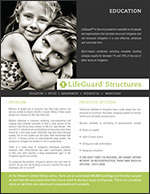 Within months, and at a fraction of the cost of building upgrades (typically under 5%), children can be protected. Parents can have peace of mind that their kids are safe at school. Amortized over 5 years - our shelters cost less than $1 per student per day, and can last virtually forever.